NEC Phones | TriTec Communications, Inc.
We are a NEC Telephone & Telephone Systems Authorized Dealer. Shop at Tritec Communications for NEC Telephone Sales, Service & Installations. NEC is the perfect platform for small to medium sized businesses that want to grow their organization and be competitive in the marketplace. Smart Communications for Small and Medium Business. Competitive businesses need the right tools to be more efficient, flexible, and productive. Competitive businesses come in all sizes. Successful businesses always have one thing in common: great teamwork. In the age of increasingly disparate working locations and job complexity, communications play a crucial part in every organization’s success. 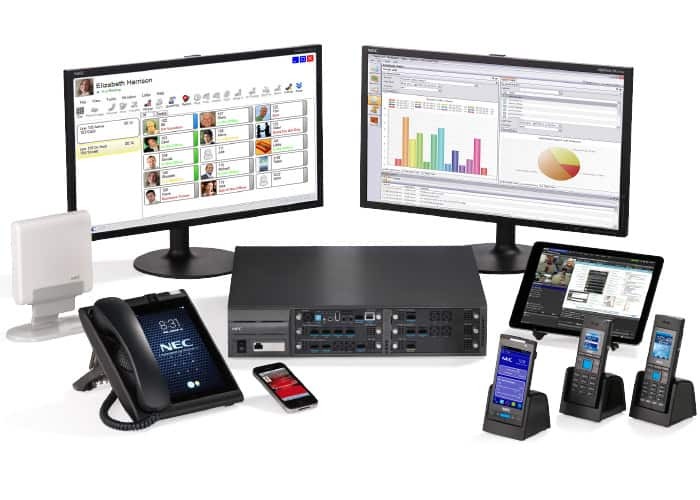 NEC’s UNIVERGE® SV9100 is the unified communications (UC) solution of choice for small and medium businesses (SMBs) who don’t want to beleft behind. the efficient, easy-to-deploy, mobile technology that they require. IP CCTV operates on existing wired and wireless TCP/IP computer networks and removes the need for running separate cables for the CCTV system, making installation quick, convenient and inexpensive.As the CCTV system operates over a network the cameras can be accessed by anyone on the same network (with authorisation).The cameras are self contained and supplied ready for connection. Because they have few moving parts, IP cameras tend to be much more reliable over time. Cameras can be accessed remotely if required. Integrated Security & Surveillance management is now an essential aspect of any business. Advances in IP Video technology can bring positive changes to many aspects of day to day operations. Remote Accessibility is a unique feature of IP Network Video Systems. Access real-time video, at any time from any PC. Remote Accessibility – Access real-time video, at any time, from any computer, anywhere. Network video products provide an easy way to capture and distribute high quality video over any kind of IP network. Cost Effectiveness – Existing IP-based networks such as the Internet or LANs can be leveraged for video applications across an organisation removing the need for additional dedicated wiring. Other connection methods such as wireless can be used. Scalability and Flexibility – A network video system can be expanded in small or large increments simply by adding more network cameras. New technologies, additional cameras, and extra storage capacity are all easily added as required, due to strongly defined and established industry standards. System Integration – With more types of system such as Access Control and building management becoming IP enabled, the ease of integration between these systems increases. Because they all connect by IP network, they are able to communicate directly and share information without the need for specialist physical interfaces. Phones, Structured Cabling, CCTV Surveillance & Security Systems, and Overhead Paging Systems. IP Phone Systems, Structured Cabling, Paging, Intercoms and CCTV Surveillance Security Systems - Business Solutions.